The Turtle Mountain State Recreation Area is located six miles northwest of Bottineau. 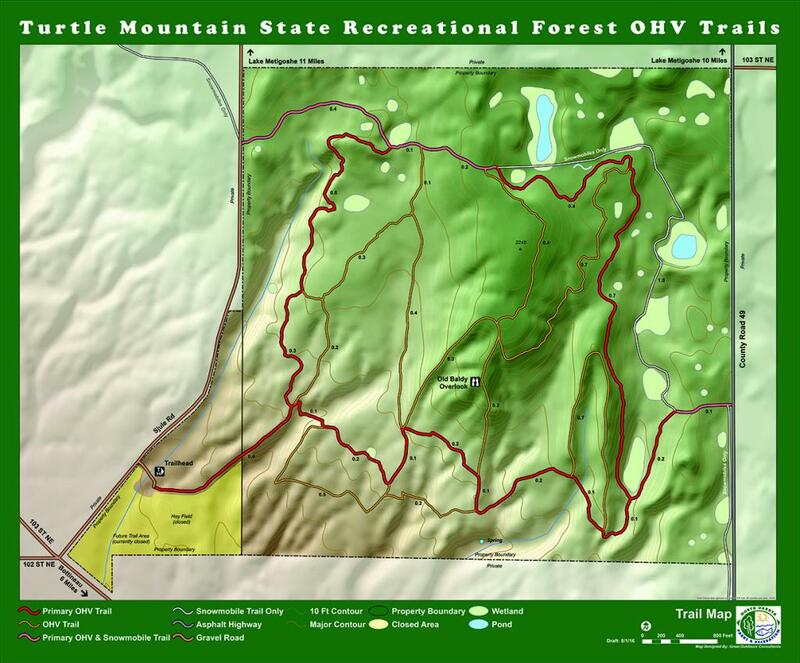 This recreation area has over 12 miles of motorized trails open to off-highway vehicles (OHV's), hiking, biking, snowshoeing and horseback riding. Drive North on Town Line Road for 4 miles. Turn left (west) onto 101st St NE for 1 mile. Turn right (north) onto 11th Ave NE for 1.2 miles. Turn right onto Sjule Road, entrance is located on the right. Drive south on Lake Loop Road to Highway 43. Turn right (west) onto Hwy 43 for 4.5 miles. Turn left (south) onto Town Line Road for 5 miles. Turn right (west) onto 101st St NE for 1 mile. Turn right (north) onto 11th Ave NE for 1.2 miles. Turn right onto Sjule Road, entrance is located on the right.